A group of graduate students and supporters delivered a letter condemning administrative behavior toward student activists to President Elliot Hirshman’s office on Friday, April 22. The letter is a response to “discretionary actions” taken by the administration in response to the MultiCultural Coalition’s Day of Action on April 14. It explains that several students marched to the president’s office to deliver petitions, but found no staff were present when they arrived. A video taken by activist Frida Ocadiz-Ortega shows the group chanting “treat your workers like you should,” as another protester slides the letter under the office door. However, activists report that members of the administration have been holding individual closed-door meetings with some of the activists, where they are being accused of breaking the student code of conduct and threatening university staff. “We believe that outrageous mischaracterization of our colleagues (as ‘swearing’ at and ‘threatening’ university employees), calls to the campus police from administration, vague mentions of surveillance and possible expulsion, and rumors of impending cuts to graduate student workers’ wages and benefits are all part of a pattern of unwarranted and likely illegal threats and intimidation in response to legally protected activity,” reads the letter. The letter also includes a list of graduate student proposals, which were included in the original documents delivered to Hirshman’s office on April 14. It calls upon the university to raise salaries for teaching assistants and graduate assistants, raise the hourly wage for instructional student assistants to $15, guarantee regular hours, and immediately abolish the student success fee and parking permit fees. 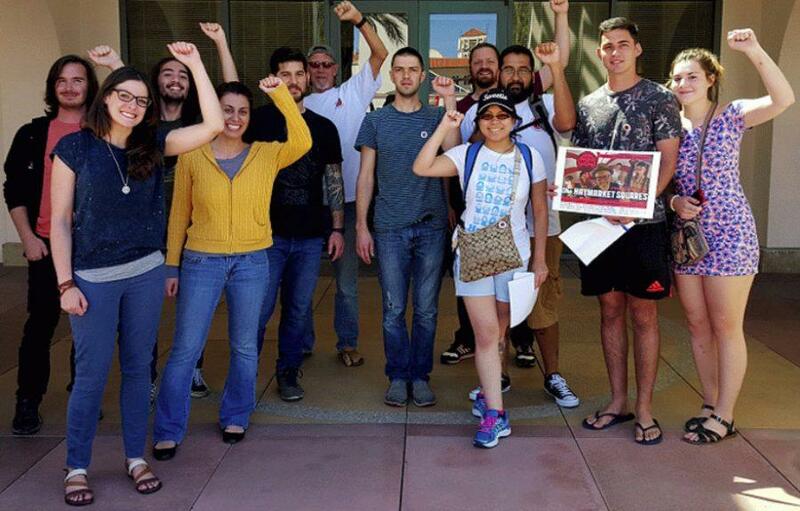 Graduate students at SDSU report that their take-home pay before taxes comes to approximately $18,000. They say the salary for similar positions at UCSD is around $29,000. “This is really about raising awareness for the issues that we face as graduate students with low stipends that make it challenging to live a sustainable quality of life in San Diego,” Lydia Wood, Ph.D. geography student said. One of the most significant challenges is the high loans many students must take out in order to attend graduate school. “I think there might be this idea that we’re just a bunch of entitled, privileged students who want more money, but that’s not the situation for a lot of us,” Wood said. Another challenge graduate students say they face is the fact that while their contract forbids them from working more than 20 paid hours per week, they often have a high workload that requires additional hours spent working. “Students in the sciences are burdened with teaching, but also with unrecognized labor and research hours,” said graduate student Aaron Nash. Graduate students say that they would ideally like to see their demands met, but the immediate goal would be to hear from the administration and to have them recognize that students have a right to organize. “San Diego State University has a long and successful tradition of shared governance,” wrote SDSU chief communications officer Greg Block in an email. “As such, when a policy issue arises, the university engages in a broader discussion of the issue through the appropriate and responsible democratically-elected body (e.g., Associated Students, University Senate, etc.). Representatives from Student Affairs regularly meet with student groups to educate them about their rights to protest and demonstrate, and how to do that without violating the student code of conduct. If a student does violate the code of conduct, they are referred to Student Rights and Responsibilities for potential disciplinary action,” he wrote. One student who came out to the April 22 event was freshman Brett Rameil. “I’m basically fighting for my future,” he said.